On Wednesday, November 17th at 12:30 PM, students across campus are invited to come out to a teach-in rally at Turlington Plaza AGAINST BLOCK TUITION. At 1 PM, the people at the rally will march to Tigert Hall and present Administration with a stack of petitions signed by students against Block Tuition. If Block Tuition is put into effect, all full-time undergraduate students (12 - 18 credit hours) will be charged a flat fee equivalent to 15 credit hours. This means that students taking fewer than 15 credit hours--more than half of UF undergraduates--would pay extra tuition money for nothing. This Block Tuition system disproportionately harms low-income and working students, who take lighter course-loads out of monetary necessity or to balance school with their jobs. 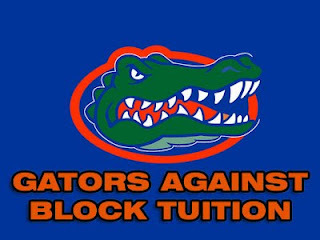 On Friday, November 5th, the Florida Board of Governor's amended their bylaws to allow a proposal for Block Tuition to be heard. The UF Board of Trustees will now design a proposal, vote on it in December, and send it to the Board of Governors to take effect in FALL 2011!! 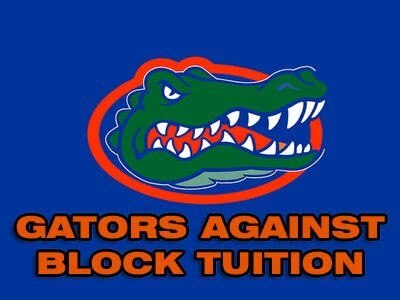 This rally is aimed at educating students about the harmful impacts of this new tuition structure, and building mass student support for a rally on December 9th, when the UF Board of Trustees hears and votes on the actual Block Tuition proposal.